The MWH1000 Weld Heads provide the ability to perform precise, low inertial welds. These Micro Weld Heads are designed for delicate parallel gap welds such as thermo compression bonding, and reflow soldering. A compound lever force system ensures accurate, repeatable welding force ranging from 30 to 1100 grams or 450 to 2000 grams depending on the model. The digital display eliminates the guess work when setting the weld force by displaying the actual force within +/- grams. The weld head has been designed to give repeatable welds with no force deflection. The parallel micro weld head models offer precision and repeatability and come standard with parallel gap electrodes. Once connected to a spot welder power supply, these micro weld heads can be adjusted to meet the needs of a variety of applications. A variety of fixed and adjustable gap electrodes, reflow soldering tips and hot are soldering tips are available. The opposed micro weld head models offer the same level of precision and repeatability with opposed-set electrodes. Setup is fast and easy and can accommodate any particular application. A variety of electrode sizes and materials are available. Each weld head can be ordered as either a pneumatic of a manual version. The pneumatic weld heads operate when connected to an air compressor and welds are created with a simple electronic foot pedal. the manual weld heads are manually operated by means of a mechanical cable-pull foot pedal. Regardless of the model, a trigger indicator light located on the front of the weld head will display when the weld signal is received form the welder. Precise positioning and electrode placement is achievable wit hall MWH models. 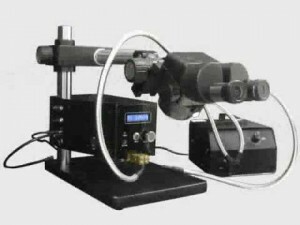 The MWH weld heads come equipped with a stereo zoom microscope with magnification options ranging from 5x to 50x zoom available. Also included is a versatile fiber-optic lighting system with full user control of brightness level and positioning.